Home > Opinions > Letter: Is there a food shortage in the world? And other questions. My name is A. C.. I am a 7th grader at Pella Middle school. We are doing a service project and I choose to do World Hunger. I want to do the best job I can. I still have a few questions. 1. Is there a food shortage in the world? 2. How is famine defined? 3. Who are the hungry? 4. What are the effects of malnutrition? 5. Are the numbers going down? Thanks for all the possible information you could provide. Is there a food shortage in the world? This question needs to be answered in two parts. First, there is enough food to feed everyone. “For the world as a whole, per capita food availability has risen from about 2220 kcal/person/day in the early 1960s to 2790 kcal/person/day in 2006-08, while developing countries even recorded a leap from 1850 kcal/person/day to over 2640 kcal/person/day” (FAO, p. 174). This is enough to feed everyone. Secondly, nonetheless, there are people who are still hungry. The major cause of hunger throughout the world is poverty: people simply do not have enough money to purchase the food they need (or land to grow that food.) A second major cause is severe disruptions of peoples’ lives such as conflict, drought, or flooding. Thus there are still many people who are hungry. The United Nations Food and Agriculture Organization estimates that about 795 million people of the 7.3 billion people in the world, or one in nine, were suffering from chronic undernourishment in 2014-2016. Famine is an extreme and general scarcity of food in a particular geographic area leading to a high number of deaths. It is most often due to a major agricultural failure or to conflict. However an important additional factor is government response which can and usually does avert a famine. The British government did not respond effectively to the great Irish famine of 1845-52, initially caused by potato crop failure brought about by a blight, leading to many deaths. Certainly two areas today where famine is a concern are Syria and northern Nigeria, both the result of conflict and, at this writing, inadequate response to the hunger caused. See for example Nigeria on the brink of famine in The Guardian. People who are very poor, and people who face severe disruptions in their lives such as drought, floods or conflict. People who are very poor live in all parts of developing countries, rural areas, towns and cities. Their hunger gets less attention because they live among people who are doing at least somewhat better. There is more attention focused on people who face severe disruptions as they are usually part of a large group. See our Africa and Asia pages for stories on examples of large groups that face hunger, with Malnutrition rates in Nigeria “horrifying” being one example. There is a range of malnutrition from severe malnutrition where children look emaciated and often with swollen bellies to less severe, where children look normal but are shorter and do have other issues. A good short summary can be read here . I would also watch the very informative Hunger in India short video which we use as the basis for one of our hunger quizzes. Are the numbers going down? Yes. 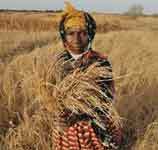 See the section called Progress in Reducing the Number of Hungry People in our World Hunger Factsheet. Thank you for your interesting questions and for your interest in understanding hunger in the world.